There are many others who had engaged the services of Wilfred Ling. These clients come from all walks of life. About one year after we got married and were expecting our first child, my wife and I decided that it was timely for us to sort out our messy insurance and investment state. In short, we were tired of insurance agents pushing to us their generic company products which were not all tailored in our best interest. We were also confused and did not feel in control of our financial planning situation. Hence, we decided to seek a fee based financial planner to help us, one whom we believed would be impartial and objective to our financial needs and goals. We approached Promiseland and were fortunate to be introduced to Mr Wilfred Ling. During the first few meetings, Wilfred came across as an sincere, confident and knowledgeable financial professional. He was patient and thorough in understanding our background, aspirations and financial goals with us. No doubt these long sessions came at a price, we felt that it was money well spent. We had a clear and wholistic view of our current financial/insurance coverage/investment situation and could embark on a robust plan for our family's future. - Mr Chan Hsien Hung and Ms Joyce Sim who first met Wilfred on December 2011. My husband and I had just gotten married, paid off the wedding and had settled into a home. Next step ? We knew that we had to start planning and investing while we were young. But with no background in finance, and a general wariness of quick rich stock picking courses we wanted to turn to someone whose advice we could trust to be impartial to help us along in our financial planning. Unfortunately a lot of the existing systems are not set up such, with the insurance as an example where advisers are compelled to urge customers toward high commission products that may not be value for money for the customers. I engaged Wilfred as our consultant after getting a general sense of his work and person, ie after attending his talks, reading his online material and meeting him for a preliminary consult. I feel more assured now having a structured plan in place that is being monitored starting off with while I continue to educate myself in this area. I first met Wilfred back in 2009 together with my husband to get started on my insurance and I am very thankful for Wilfred's unbiased recommendation on the insurance plan that gives me a 360-degree coverage. The learning curve was steep for me but Wilfred was very patient in explaining the policies. I had been through 2 operations in the past 5 years and during which I had the peace of mind not just because my medical expense was covered, but also the fact that Wilfred is very good in what he does and he is always prompt to advise the next step in such events. I definitely would recommend anybody who wants to get serious about their financial planning to meet Wilfred! - Ms Nicole Leung who first saw Wilfred on January 2009. I was looking for a fee-based financial planner when I came across Wilfred’s name. It is reassuring to know that based on this remuneration scheme, the advice that I received would be impartial and suitable for my situation. From my meetings with him, Wilfred has always been professional yet approachable. He was always patient with my questions and would answer them one by one to ensure I understand the reasons behind each decision. I am especially grateful to him for sorting out my insurance applications, as my application was not straightforward. I am happy to have him as my adviser. - Dr Lim Kia Boon who first saw Wilfred on September 2011. I came across Wilfred's blog when I was sorting out my family's health insurance coverage. After reading his library of articles, my wife and I decided to engage Wilfred for a comprehensive financial planning. My initial expectation was simply to sort out our insurance portfolios, but the final report not only sorted out our insurance needs but provided practical and necessary details such as retirement savings/investments, mortgage management, tax management and will planning. Wilfred comes across as a very practical person and this is reflected in his approach to financial planning – all recommendations were explained thoroughly followed by instructions on how to execute the recommendations. I feel a whole lot more secure now knowing that our finances are structured by Wilfred's professional and unbiased recommendations. His thoughtful work is repeatedly reflected with every yearly review and his meticulous and conscientious approach to our personalised financial requirements never fails to impress us. - Dr. William Chan & Dr. Valerie Ng who first saw Wilfred on 11 July 2012. 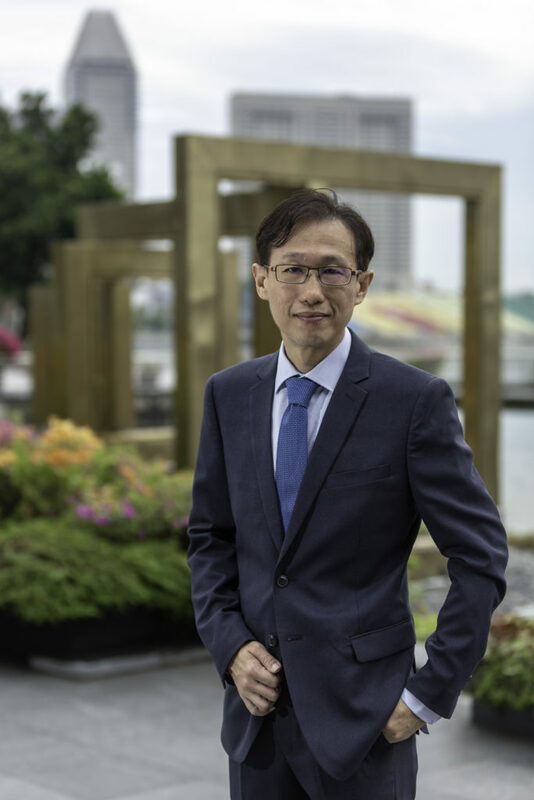 As one of the few financial planners in Singapore who is fee-based, Wilfred is a very natural choice for us as we’ve always felt that commission based financial planners have severe conflict of interests. We've also felt that insurance agents who push their products on us never take reality into consideration and thus always make inaccurate recommendations especially when it comes to the amount of insurance that we need for our family of 4. Wilfred is very professional in his dealings with us. He reviewed our entire financial situation and was circumspect even when reviewing the duds in our investment portfolio. He was able to explain clearly and rationalize how he developed our Financial Planning Report. He gave us the peace of mind that we’re almost adequately insured, provided us with the next steps and simplified our investment portfolio which had grown unmanageable over the past years. He was patient when we were comparing insurance policies and pointed out the pros and cons of each policy. Even when we made funny requests, he accommodated us readily. We look forward to working with Wilfred in the years to come. - Mr and Mrs C.T. Tay who first saw Wilfred on Nov 2009. I have worked with Wilfred over the last 1 year and he has helped me with insurance, investment and lately tax planning. I see Wilfred as a trusted partner on wealth planning and acquisition. He listens to needs well, keeps up-to-date with the market and assesses every situation objectively. His solution based approach takes away the pain of planning and allows me to focus my mind and energy on reaching my goals. I look forward to working with Wilfred in the years to come and wish more people can experience his service. Wilfred is a specialist in his own field and worth having as an advisor to guide you through the turbulent monetary environment that we find ourselves in. Wilfred really knows his stuff. His advice has been sound, objective and readily available. I feel now that there is a way for me to improve my financial portfolio to provide me with more security and peace of mind. I approached Wilfred after becoming uncomfortable with the advice of 'free' advisors who make their income from the commission on the products they sell - I realised that this fact made a big difference to their recommendations. With Wilfred I have peace of mind that his recommendations are well-tailored to my needs; and all financial transactions are totally transparent. I have been impressed with his service and would strongly recommend him to anyone seeking a financial advisor. - Mr. Alexander Mucha, a businessowner who first saw Wilfred on February 2009. Mr Wilfred Ling should be considered as one of the rare financial professionals because he does not simply recommend or sell any financial products that are hot in the market to his clients. I knew Wilfred even before he made a drastic change in his career from a highly qualified engineer in an established company to an Independent Financial Adviser in Promiseland. Before he made this change, he has already demonstrated his critical and impressive ability in investment and insurance matters. So it was no surprise when he decided to take the plunge, leaving his comfort zone behind to pursue his interest and calling. I am a conservative person. So preservation of my money may be my top prority. Wilfred will usually update me via email whenever there are such suitable financial products in the market. He does not start calling or pressing me to buy them. Instead, he leaves the decision to his clients and always reply promptly with his unbiased views, should I asked for further advice or information. Recently, Wilfred has managed to arrange a special service on Will Writing for his clients. Making a will, though may be part of financial planning, is not his forte. However, we all know that it is extremely important to have a will written because it is the voice or intention of a dead person. He does not hesitate to provide such additional service to his clients. This has again demonstrated his willingness to serve only the best to his clients. Wilfred has been my financial advisor for more than 2 years, since I started working as a fresh graduate. One of his best traits is his honesty and ability to provide fair and sound advice to each individual, based not on the amount of earnings he can get with each policy he manages to sell, but on each client's needs and interests. He is passionate about his job, and shows great responsibility in responding to client's requests and queries. I enjoy working with Wilfred and trust that my plans will be in good hands under his care. 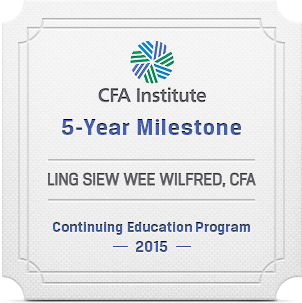 - Ms Woo Qiao Ling, an Analyst (Risk Management) who first met Wilfred on September 2006. On my route to establishing a proper financial plan to protect and cater for my family's future, I had done much research as well as approach my existing agent and friends who have gone into the IFA line. However, after spending much time and effort, I realised that I needed someone who was truly independent to review my stack of 20+ insurance policies and other assorted investments. Having come across Wilfred's blog and forum postings during my research, I was pretty sure that he was up to the task of sorting out the mess that I had accumulated over the years. And he certainly did not disappoint. Despite my long list of queries and nick-picking, he was always very patient in explaining the details to me and helping me decide on the most appropriate plan. Although I will not qualify as his favourite client, I am definitely his most memorable to date in setting a new record for most number of policies. - Mr. Lim, a Civil Servant who first met Wilfred on December 2008. If you are looking for a financial advisor who has strong willingness to understand your goals, answer your questions and concerns patiently and professionally, explain and go through with you his intended strategies in detail to reach the financial goals you have set out, Wilfred Ling is strongly recommended. I was very glad and pleased that he called and reminded me that it’s time to review my portfolio; he is certainly reliable, looks out for client’s interest and committed. - Ms Elly Lee, an air stewardess who first saw Wilfred on April 2007. I've approached Wilfred after reading about his views towards personal protection. After our 1st meeting, I was impressed with the way he presented my viable options, and never tried to push-sell any products, allowing me to make the final decisions. His after-sales services has been excellent, and I strongly encourage those who need sound insurance advice to engage him as your IFA . - Mr. Wong Keng Meng, a Financial Services Manager who first met Wilfred on April 2007. I approached Wilfred 2 years ago when i was still a NSF to review the insurance coverage for my family. He is very patient and professional as he explained to us on all our existing insurance products although these were not bought from him. As a competent IFA , he was also able to explain to us every detail and make comparison between various products of the similar class. He is also very transparent in explaining to us the pros and cons of each product. His excellent advice and after-sales service provided us lots of assurance and help when there were some insurance claims a few months ago. Overall, I rate him as the best financial adviser that my whole family had met till now. One of my best friends introduced me to Wilfred, whom I found to be professional and extremely patient with my queries. More importantly, he was not in the least 'pushy', unlike some other financial advisers/agents whom I had known. He gave frank and valuable advice on the types of policies I require, and those I do not need at this moment. I'll certainly recommend Wilfred to anyone who requires financial advice. - Mr. Jason Lee, an editor who first met Wilfred on November 2008. I was heading overseas for studies and needed to sort out my insurance policies before I left. Reading through Wilfred's blog I sensed his dedication towards serving his client's best interests and decided to consult with him. I have found Wilfred to be an exemplary advisor: he is patient, knowledgeable and willing to explain in detail the pros and cons of each product he recommends in order to help his client make an informed decision. I strongly recommend Wilfred to anyone who is in need of financial planning advice. - Ms Mok, a post-graduate student who first met Wilfred on March 2007. I first learnt about Wilfred through a forum. After combing his blog archive, I realized Wilfred was a breath of fresh air. Unlike other advisers I've met who are pushy, relentlessly irritating, and usually armed with recommendations for ILPs, Wilfred understood my needs and advised cost-saving policies to meet my protection needs. I'm very pleased to have met Wilfred whose service and advice is exemplary of a professional. More than that, he is someone I trust to genuinely look after my interests. - Ms Sherry Tan, a teacher who first met Wilfred on September 2008. Wilfred has been my IFA for a few years. So far I have engaged him in reviewing and/or selecting insurance coverage. I am more than satisfied with the service he has provided. I find him to be honest, forthright and efficient. He is always willing to clarify any queries I have. - Mr. Ng Hong Joon, an actuarial consultant who first saw Wilfred on Oct 2006. Wilfred was introduced to me by a friend. I find him to be very knowledgeable and approachable. He provides satisfactory and easily understood explanations. I have confidence in his professionalism, expertise and integrity. Thus far, I am very happy with his financial advice and will definitely continue to engage his services. - Mr. Lee Kin Hoe, an actuarial consultant who first saw Wilfred on December 2007. Wilfred is very sincere and he always tries to understand my needs before making any financial recommendations. If you want to make big decisions regarding your financial life, you need an adviser who can put your interests first, Wilfred is such an adviser. I am confident that all my insurance and investment are in the right hands because these were recommended after doing comprehensive analysis. I wished I met him earlier, as I could have avoided making some mistakes in my earlier working life. Thanks for being there for me, not only as advisor, but also as a teacher and friend. I am impressed by Wilfred's thoroughness and patience. He not only provided an all-inclusive insurance solution while saving me a bundle in unnecessary premiums but he made sure to tailor the coverage to my needs. Wilfred is now managing my investments as well. I feel secure knowing that I've found a financial advisor who genuinely looks out for my financial interests and aspirations. - Ms Norlizah binte Abdul Wahab, an enrichment center teacher who first saw Wilfred on September 2007. I engaged the fee-based service from Wilfred to look at my existing investments and to construct a diversified portfolio. He analyzed my existing holdings and recommended a portfolio consisting mostly of index funds. The usage of a Trust to protect my assets from potential future creditors was also recommended. With the 33 pages report he did for me, I now come to know of the various instruments which previously was not known to me. The fee I paid was value for money. - Mr. Cheng, a businessowner who first saw Wilfred on July 2008. I'm not a financial expert so it's good to have a professional develop a plan for my investments. Through a fee-based investment plan consisting 14 hours of work, Wilfred was able to provide financial advice that was useful, if not educational. - Ms Wong, a teacher who first saw Wilfred on June 2008.